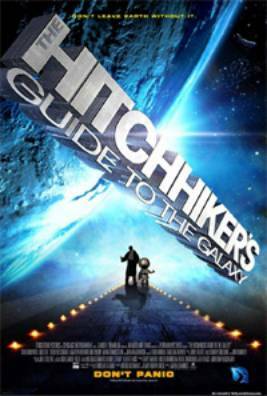 The Hitchhiker’s Guide to the Galaxy is a wholly remarkable movie. It has already supplanted Revenge of the Sith as the science fiction movie to see this year, for though it has many omissions and contains much that is apocryphal, or at least wildly inaccurate, it scores over the older, more pedestrian work in two important respects. First, it has a slightly cheaper budget, and secondly it has the words Don’t Panic inscribed in large friendly letters on its ad campaign. 25 years in the making (and four years too late for its late and much lamented author), the movie version of The Hitchhiker’s Guide is a wonderfully fun return to Douglas Adams’s droll and goofy universe where the hero is not interested in bringing down evil galactic empires or going boldly where ever increasing numbers have gone before. Rather, he just wants a good cup of tea. For those of you who have spent the last quarter century living under a ravenous bugblatter beast: harried everyman Arthur Dent (played by Martin Freeman) escapes from earth just before its destruction when it turns out that his friend, the unusually named Ford Prefect (Mos Def), is not an out of work actor from Guilford at all, but is in fact an alien doing research for an encyclopaedia called The Hitchhiker’s Guide to the Galaxy. They are eventually rescued by Zaphod Beelbebrox (Sam Rockwell), the President of the Galaxy who has kidnapped himself and stolen a prototype spaceship, and his companion Trillian (Zooey Deschanel), a woman from earth that Arthur once met at a fancy dress party and promptly blew it with. Together with Marvin, the ship’s paranoid android (played by Warwick Davis, and wonderfully voiced by Alan Rickman), they blunder into a series of adventures while they attempt to discover the answer to the ultimate question of life, the universe and everything. Or rather the ultimate question, since the answer only makes sense if you know the question. The rest of the cast is uniformly excellent as well. Martin Freeman brings a confused yet compassionate feel to the embittered Arthur Dent, a man who has lost literally everything, yet still manages to find hope in his loss. Mos Def is sufficiently out of the ordinary as the alien Ford Prefect, but unfortunately his character all but disappears by the movie’s end. And kudos to the always-interesting Bill Nighy who brightens things up as Slartibartfast, the planetary engineer who built all those fiddly bits in Norway. John Malkovitch plays a new character, spiritual leader Humma Kavula, and is generally wasted in the role and has little screen time. But Humma’s is the only plot thread that is ultimately left dangling – for a sequel, perhaps? And the Malkovitch character does lead into a new subplot that takes our heroes into some unexpected places, including a funny new piece of classic Adams business on the Vogon home world involving original thoughts and a shovel in the face. Inevitably, one must ask how does it compare with previous incarnations. Adams never intended any particular version of Hitchhhiker’s to be definitive; each version, be it radio, book, record (remember those, kiddies? ), stage show, or television, would be what it was. So perhaps there’s little point in comparing this to other versions. Indeed, one of my favourite bits of business, the conversation between Arthur, Ford and the construction foreman intent on knocking down Arthur’s house, is sadly truncated, and my favourite bit of dialogue in the whole darn five-part trilogy has been excised. And there are other missing bits that surely should have been included, including the revelation that earth only rated a one-word entry in the Guide: “Harmless.” Doubtless these will all be included on the inevitable DVD director’s cut. But the question of which version you liked best is akin to asking yourself which is your favourite James Bond. Your favourite Bond is the one that you discovered first. And if this film draws more people to read the works of Douglas Adams, that can’t be bad. Review by John W Herbert.